That day in St. Louis was myopic. My brother Trent knew a guy at head office St. Louis, and that gentlemen made a few calls and arranged for my dad and I too receive ‘Field Passes’-and to be interviewed by Fox-Sports Midwest. I was almost in disbelief of that option, but it was now going to happen later that day. 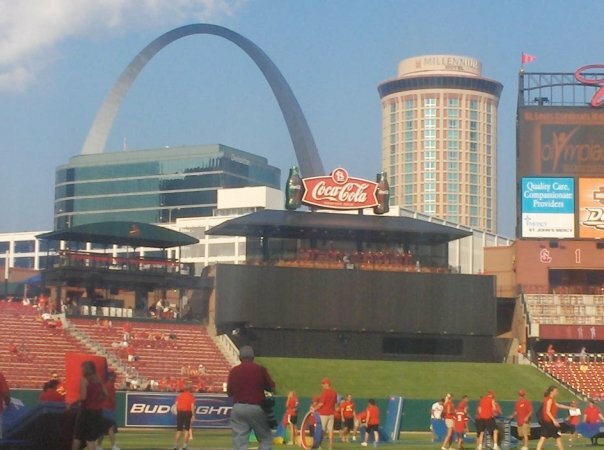 This experience was even better because none of us had been to new Busch Stadium-so all of us were there for the first time. Overall it was my 29th stadium so I only had “The Ballpark In Arlington” for stadiums left to complete my active 30. 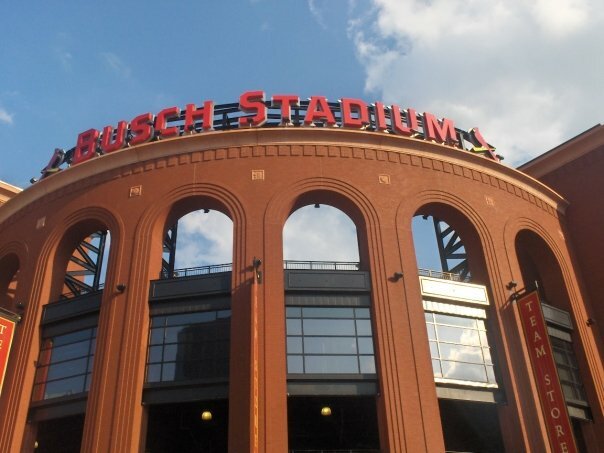 Much like Coors, Safeco and AT&T Park, the red-brick around the whole Stadium at Busch Stadium is top-notch. I echoed those sentiments when it was my time to talk to the camera. I was surprised I was not nervous. I had kind of being interviewed a lot over the last 6 weeks-so this was almost to be expected for me now. 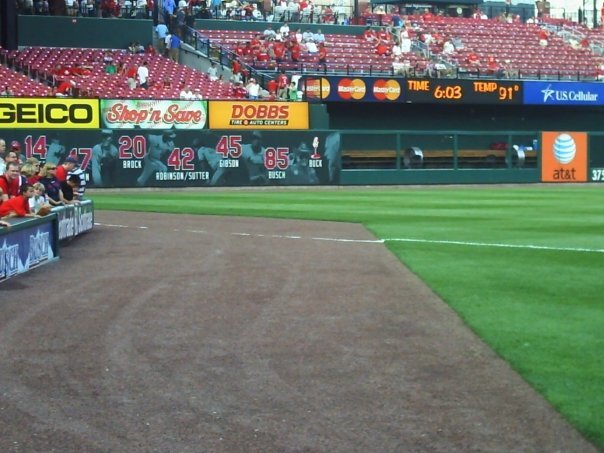 To be on field at Busch Stadium with my dad was one of my top 5 memories all time with him. We have some great pictures to prove we were there that close on the field. At was at this point that all of the hard work, sacrifices, spent money, planning, studying had paid off because my brothers and my dad were going to have these memories forever. I told the Fox guy that on the camera. The guy from Fox wished me the best-and then I waved to Albert Pujols even though he did not see me that well, he waved back. Not because he knew me or anything, but because he was cool. Man that guy is big! I was about 20 feet from him-I wanted to thank him for saving my bacon that night in Atlanta, I told that story to Fox too. 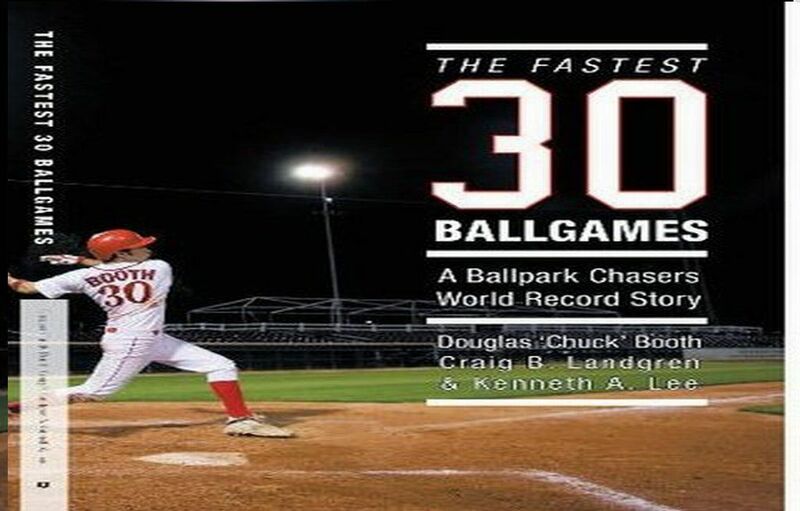 Busch Stadium is such an awesome park-and their staff was truly amazing to us Booth Boys. What a game we saw, we saw as Ryan Ludwick crack 2 homers into Big Mac Land in Left Field, and Pat Burrell cracked a home run that almost hit us in the standing room area we were standing in. Had we known how awesome our seats really were-we would have sat there the whole game-we did sneak in the last few innings. None of us wanted to leave the ball park. We were only a few hundred feet from the Hilton where we were staying. We made the trip out of the park and we headed to Mike Shannon’s for steaks and drinks. My brothers and dad partied as I told them I would drive all the way to Chicago the next morning. It was a noon start for those guys-and I was going to drop them off at 10 in the morning or so before I made another 6 hours drive to Minnesota. At least I knew the way to Minnesota-as I had done the drive in my cross-country trip with the Cavalier in 2007. We probably didn’t even need the hotel room that night. I felt bad about having to wake these guys up early and after a few hours sleep only. The whole St. Louis to Chicago trip in consecutive trips always carried that time of ballgame. It was really 4 games in 3 ½ days. Those guys all slept, I was in the business center re-arranging the rest of my journey. I had Minnesota the next night, and then a doubleheader match-up on Sunday that would put me at 28 games in 26 days. I then had Toronto on the 4th of August-before the Chicago White Sox was the trip finale on the 5th. My flights had been pre-bought for me to fly out of Texas on 5th because I knew I could always use my mom’s flight pass from Dallas Texas to Toronto on the 4th. She had already informed me that-should I make the double header-which I would have no problem flying into Toronto on her pass on the 4th-and then flying on her pass to Chicago on the 5th. Again my ticket with American Airlines was flying from Dallas to Toronto on the 5th and from Toronto to Chicago on the 6th. This meant I could use my original flight. Posted on August 3, 2012, in The Rest: Everything Baseball and tagged albert pujols, at and t park, ballpark in arlington, Budget Car Rental, busch stadium, busch stadum, chicago white sox, Chuck Booth, clint booth, coors, Dallas, Fox Sports Mid-West, hilton, hilton hotels, Houston, ken booth, metrodome, mike shannon’s steakhouse, Minnesota, nancy booth, pat burrell, philadelphia, Philadelphia Airport, ryan ludwick, safeco, sicklerville, St. Louis, stl, texas rangers, tom booth, toronto, Trent Booth, wrigley field, yankee stadium. Bookmark the permalink. Leave a comment.